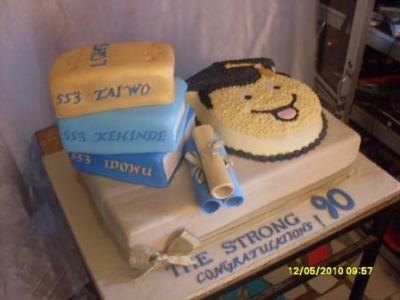 To make this graduation cake, I baked a 22 by 18 inches rectangular cake for the base. A 14 by 10 rectangular cake was baked and cut into 3 for the books. A Smiley grad baking tin was used for the Smiley grad and decorated with buttercream while all others were covered with fondant. The scrolls were made with Mexican paste and tied with ribbon. Very nice and that sure is a lot of cake!!! Wow! Join in and write your own page! It's easy to do. How? Simply click here to return to Graduation Cake.